Ganha até 1,01 US$ com a Kinguin Mafia! Sabe Mais! Product is restricted to accounts compatible with EUR currency! The Wii U™ console, Nintendo Switch™ and Nintendo 3DS™ systems offer exciting downloadable games, applications and entertainment once you connect your game system to the Internet*. You can purchase both retail and download-only games, free demos, and applications to enhance your experience. These prepaid cards can be redeemed on any Wii U console Nintendo eShop or Nintendo 3DS Nintendo eShop — so get connected and start downloading today*. For more info about Nintendo games and systems, check out http://www.nintendo.com. From the console HOME Menu, select the Nintendo eShop icon. Select "Add Funds with a Nintendo Prepaid Card." Enter the activation code from the back of the prepaid card, then select "OK" to complete the transaction. 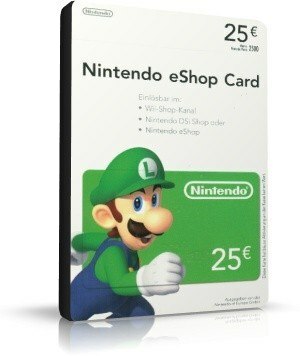 When you enter the card's activation number on your Nintendo 3DS, Nintendo Switch or Wii U system, the card balance will be associated with your Nintendo 3DS, Nintendo Switch or Wii U System and will be non-transferable. There will be no remaining balance on the card.